New research reveals a surprising find among 90 percent of crafters. Break out the hook and yarn: the results are in, and it looks like crocheting yields many positive health benefits. According to a recent survey done by Pippa Burns and Rosemary Van Der Meer with the University of Wollongong Australia, crocheting can positively affect your well-being. The University conducted a survey utilizing over 8,000 participants who were asking about their crocheting habits. Of this survey, an overwhelming majority of respondents were female (99 percent)—half of which were between 41 and 60 years old—and say that they pick up their crochet hook and yarn on most days, if not every day (77 percent). Experts found that 90 percent of people said that crocheting made them feel calmer and 82 percent said it made them feel happier. Over 70 percent of people also felt that crocheting helped improve their memory and concentration. "The results from the survey show that crocheting provides many positive benefits for people in terms of wellbeing," Dr. Burns tells us. "Being aware that crocheting can provide positive benefits may encourage people to take up the hobby as a self-care strategy." The final results are simple validation of what avid crocheters already know to be true: that crocheting can be used as a way of self-care. Another common problem that has been researched in relation to crocheting is insomnia. 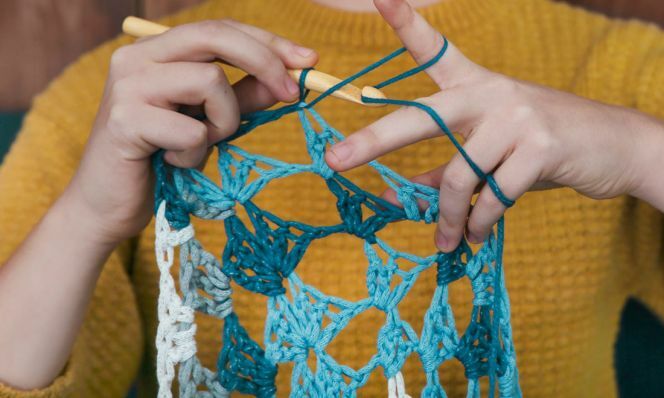 According to the American Counseling Association, the easy, repetitive movements that make up crocheting can ease your body and mind to wind down enough to get to bed. And according to the Craft Yarn Council, crocheting has also been shown to reduce anxiety by solely focusing on the project in your hands. Whether you suffer from anxiety, insomnia or just really like crocheting, one thing thing is for sure—these results are motivation to try this hobby out.